With an aim to regulate and correct fluctuating power supply, we are engaged in manufacturing, supplying and exporting Automatic Voltage Regulating Relay. 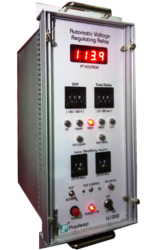 Under the offered range, we have Transformer Monitoring System, Automatic Voltage Regulating Relay(AVR) DX-500A, Automatic Voltage Regulating Relay(AVR) FX1000, Automatic Voltage Regulating Relay(AVR) FX4000 and Automatic Voltage Regulating Relay(AVR) FX1000L. We manufacture these regulating relays by making use of the high grade raw material in strict adherence with the established quality standards. Prior to dispatch, we make this array of regulating relays pass a quality check so as to ensure it is fit to be used by commercial and residential sector. We, Pradeep Sales & Service Pvt. Ltd., are engaged in manufacturing, supplying and exporting wide range of Automatic Voltage Regulating Relays. These are manufactured in accordance with universally accepted quality standards. 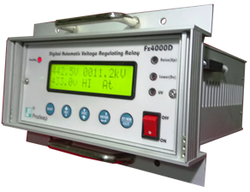 We have gained expertise in offering Automatic Voltage Regulating Relay (AVR) FX4000. To ensure that our offered voltage regulating relays is fit for electrical machines, testing motors and TRF, we manufacture these using best grade raw material. After completion of the production process, we check these regulating relays so as to get ensure on their quality aspect. We are an eminent organization engaged in offering high grade Automatic Voltage Regulating Relay(AVR). Manufactured using premium quality raw material, offered regulating relay is in-line with the universally accepted quality standards. To ensure the higher level of patron satisfaction, we provide this regulating relay in accordance with the specifications detailed to the patrons. Patrons can avail from us Transformer Monitoring System. Offered monitoring systems are widely appreciated as these are fitted with moisture monitoring sensors and are ideal for monitoring power and distribution transformers in the electric network. In addition to this, provided monitoring systems augment the reliability of the technical date such as current & voltage. These monitoring systems also present the information about moisture and oil temperature & level in the transformers. 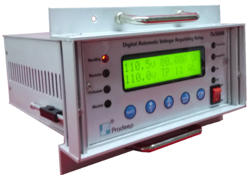 Backed by sound infrastructure, we are able to manufacture, supply and export Automatic Voltage Regulating Relay. To ensure the peerless standards of offered regulating relay, we manufacture this by making use of the quality assured components and other required raw material, sourced from the most authentic vendors. In addition to this, we keep in mind the universally accepted quality standards while manufacturing this regulating relay. For Further Detail Refer For Attached Pdf. File.